If you've never used Roblox Studio before, /articles/Studio Setup|download and install it first. Then come back here to start your journey. Let’s begin by checking out a sample obby, short for “obstacle course.” In an obby, players jump from one place to another while avoiding obstacles to reach the end of a level. Templates are pre-built Roblox projects that you can use as a start for your own games. There’s an existing obby template you can test to get an idea of what you’ll be making. In Roblox Studio, click the New button in the upper-left. If you have any projects open, first close them (File → Close) to access the New button. Find the template named Obby and click the tile to open it. To test the obby template, simply press the Play button. To stop playing, press the Stop button. Now that you know what an obby is, it’s time to create your own! First, click the in the Obby tab (or File → Close) to exit out of the template. Don’t worry about saving any changes if you’re prompted. Now, start with a new project file by clicking the Baseplate template. We’ll need a completely empty world to start building the obby, so you’ll need to delete the baseplate. Look for the Explorer window which lists all the objects within your game. You can use the Explorer to select and work with parts even if you can’t see them in the game editor window. 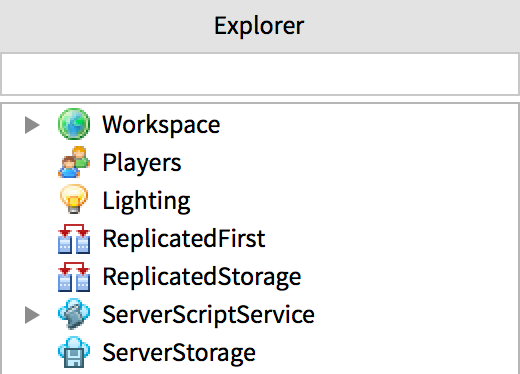 Click the small arrow next to Workspace in the Explorer window to expand the tree. Click on the Baseplate to select it. In Roblox, a SpawnLocation marks where a player appears in the world at the start of the game or after restarting. Without a SpawnLocation, players might spawn in the middle of nowhere and fall to their doom. In the Explorer window, hover your mouse over Workspace. Scroll through the drop-down list until you find SpawnLocation and click on it. The new spawn location will be created at the exact center of your camera view. Now that you have an object in your game, move the camera around to get a better view. If the camera doesn't move, first click inside the game editor window. Parts are the building blocks of a game. You can use them to build a series of platforms for your obby. Select the basic part type you want to create: Block, Sphere, Wedge, or Cylinder. A new part will appear at the exact center of your camera view. Select the part (click on it in the game editor window). Use the camera controls you learned earlier to get a good view. Drag the colored arrows to move the part near the spawn location, giving players an easy first jump. If a part only moves in “steps” or rotates 45° at a time, this is because of snapping. Snapping is useful when moving parts that should be placed exactly together, like the walls of buildings. To adjust the snap amount, enter a different number for Rotate or Move (or click the small arrows within the fields). Alternatively, you can turn snapping off by unchecking the box next to Rotate or Move. If you play your obby now, you’ll notice that any parts you’ve added other than the spawn location will fall into empty space. Anchoring locks parts in place and stops them from moving — they’ll even stay in place when players or other objects bump into them. Anchor parts by selecting them and clicking the Anchor button. Changing the size and angle of parts lets you creatively design your obby and adjust the difficulty. Select a part in your obby and drag the colored handles in any direction. Drag the handles on the sphere to rotate around an axis. If you set collisions on, you won’t be able to move a part into any position where it overlaps another part. If you set collisions off, you can freely move parts anywhere in the world. One jump isn’t enough to make a really fun obby, so add more! Using the tools you’ve learned, add 5 - 6 more parts. Try creating different part types like cylinders or wedges, and using different sizes and rotations for variety. As you create more parts, remember to view your obby course from multiple angles. Parts might not line up the way you think if you're only looking from one direction. If any of the parts fall down into space, you probably didn't anchor them. If a part is scaling or rotating in "steps," you may need to adjust or turn off snapping. If a part is being blocked from moving or rotating into another part, turn off collisions. Playtesting is the process of testing a game to make sure everything works and figuring out how to make it even better. Play the obby now to test your design (click the Play button). Make sure your game works, particularly changes you just made. Look for areas that can be improved and balanced. If all of the jumps are too hard, players will get frustrated, but if the jumps are too easy, they'll probably get bored. If possible, ask a friend to playtest your game — sometimes a jump you think is easy will be difficult for someone else! It’s good practice to publish your game to Roblox every 10 - 15 minutes. In addition to saving your work to a secure place, publishing allows other players on Roblox to play your game. Select File → Publish to Roblox. When the bar is full and you see “100% Completed,” click the blue Next button. On the next screen, you’ll see information about extra features. You can skip those steps for now — just click the Done button. Congratulations, you’ve created your first Roblox game! Where next? Add more color, start coding, or build rotating platforms by exploring the tutorials below.